The 6.5x25 CBJ High Energy Transfer has a full caliber solid brass projectile with a hollow base. It is designed to be optimized for Law Enforcement users, who unlike military users, don´t need maximum penetration at maximum achievable range. 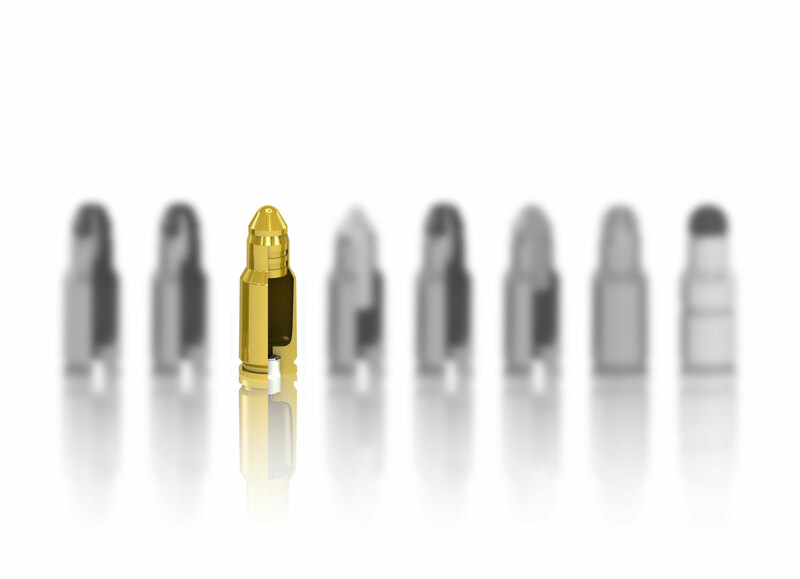 The bullet is highly effective against targets with moderate levels of protection within a range of about 50m, after which lethality is rapidly reduced, making it suitable for use in sensitive environments. There have been discussions regarding problems with over penetration, which is when the projectile hits the intended target, but penetrates through it and continues with the risk of hitting a third person. This has led to the widespread use of hollow point expanding projectiles. The HET usually penetrates an entire block of gelatin (34cm), but when doing so, it dumps almost all of its energy making it less than lethal after exiting the block. Another aspect is what happens if the projectile misses its intended target. Research have shown that during typical police shootings, the average hit ratio is somewhere between 10% and 15%, which means that the majority of the projectiles fired never hits the intended target. These shootings usually occur in urban areas and this is a far bigger problem than over penetration. A 9x19mm hollow point projectile is lethal as long as it stays in the air, which can be well over 1,5km. The HET projectile is designed to have a high muzzle velocity but poor long range ballistic performance, giving it a high wounding effect and good penetrating performance at a limited range of 50 to 70m depending on barrel length. 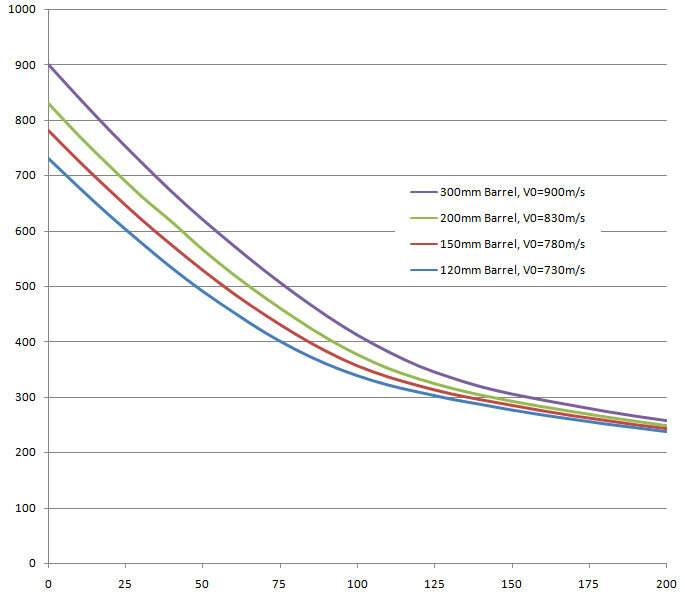 At 400m the projectile has the energy equivalent of a BB gun. 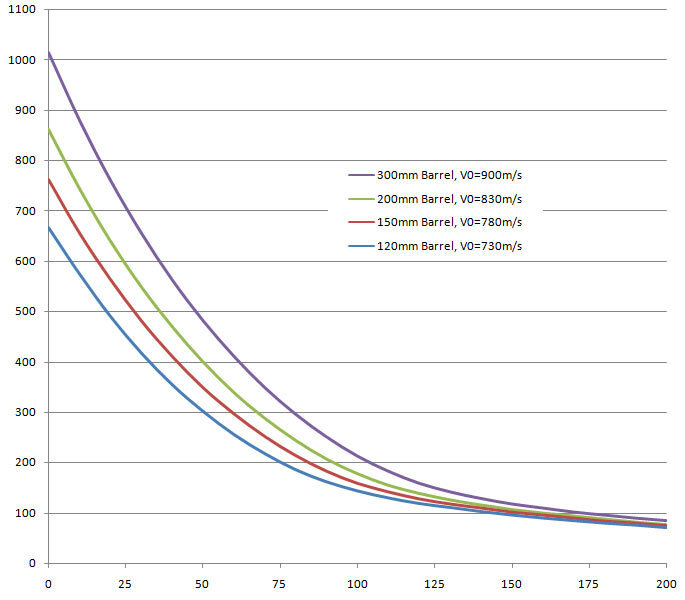 The 6.5x25 CBJ HET has the same projectile weight as the Ball and ST (core projectile and sabot) and the same load, giving it the same muzzle velocity and recoil. This makes it possible to mix these different types of cartridge in one magazine and the shooter will not be able to tell which shot is which. This makes the HET a good alternative for short range training as well. The sharp edge where the cone meets the cylinder on the projectile makes it a very good paper puncher. 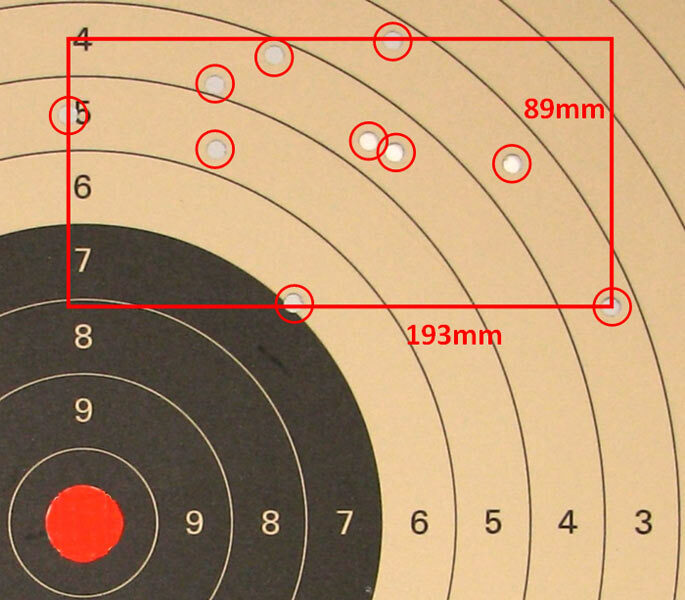 When shooting at paper targets the holes are very precise and very easy to score. 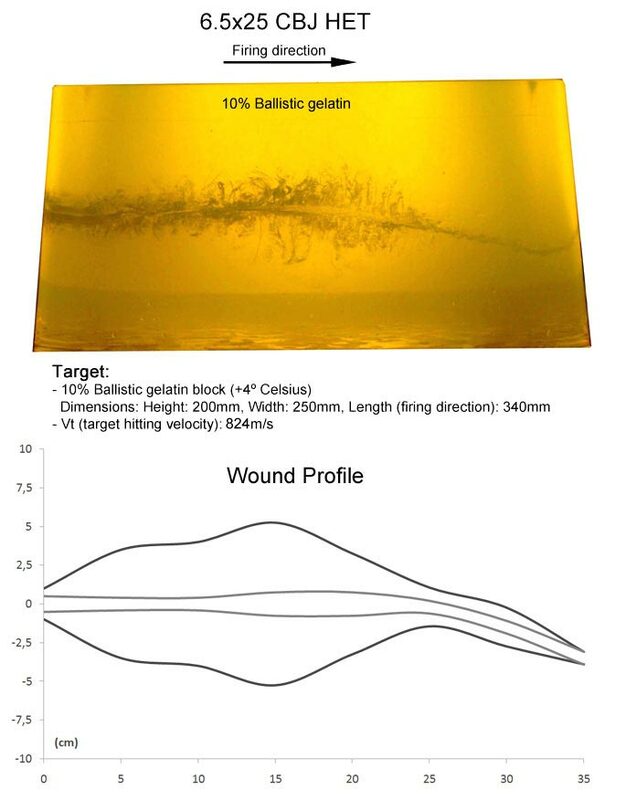 Shown hereis the effect of the 6.5x25 CBJ HET in bare ballistic gelatin with corresponding Wound Profile. The penetration capacity of the 6.5x25 CBJ HET is carefully balanced so that common barriers are defeated and wounding effect is assured at short range, while performance is greatly reduced beyond this and at greater range. A typical difficult situation in the Law Enforcement application is a target inside a vehicle. 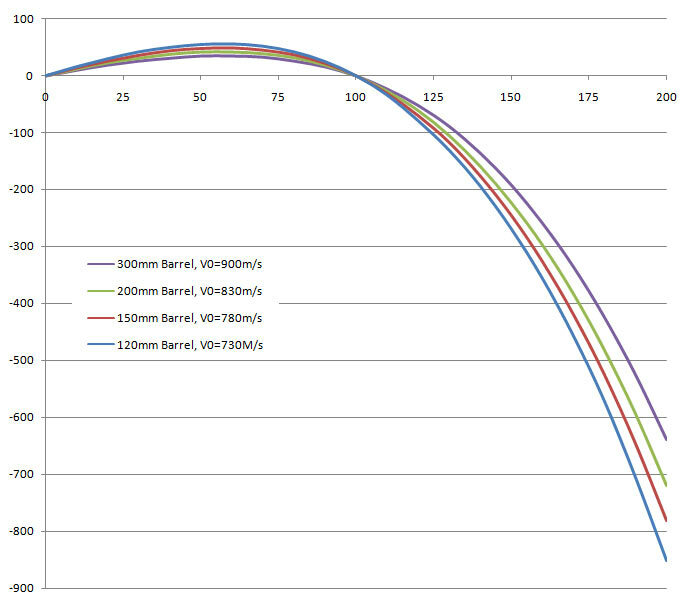 Seen below are the test results of a simulation of such a situation. 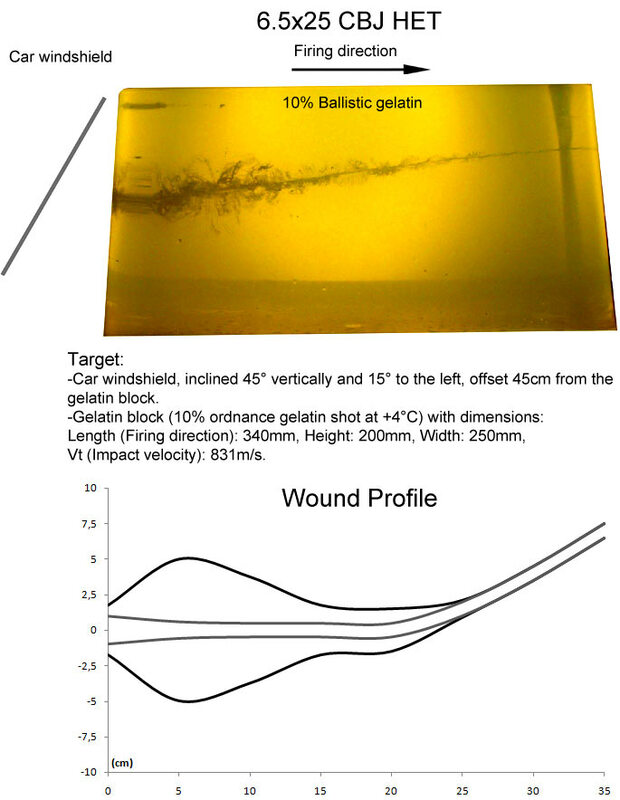 The windshield was penetrated as was the gelatin block behind it (34cm). After this the projectile had negligible energy. 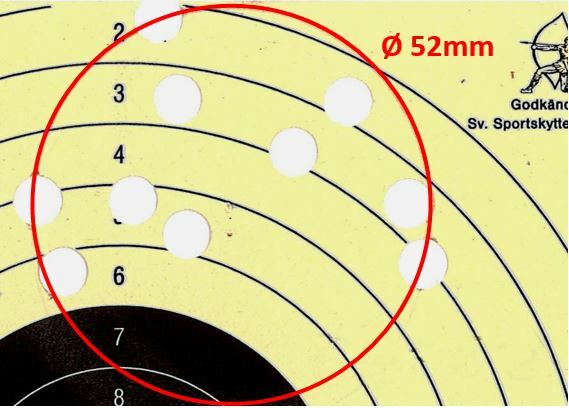 Several tests have been conducted with the 6.5x25 CBJ HET and the normal hit pattern at 50m range is all hits within a 50mm circle. The 6.5x25 CBJ HET has been tested side by side with the 6.5x25 CBJ Frangible and the conclusion is that the precision is comparable. Examples of typical hit patterns at 100m range can be seen on the picture to the right.